Brian was blessed to have a forced first had experience in the family business. Working alongside his Father, John Lockhart, Brian was in charge of production in the 90’s . It has been over 23 years and Brian still cannot wait to come to work every day. He is proud to have earned his in house title: PHD (Professional Hole Digger). Brian has been directly responsible for evolving the business beyond the pagers and que cards of yesterday, however this would not have been possible if it were not for a solid foundation in the family business. 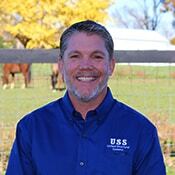 Brian’s personal goals are to honor his parents and pass the same values on to his three sons and his extended family at USS. Brian Graduated Millard north high school in Omaha, NE. attended University of Nebraska. Brian was born in Boyle County , KY moved to FL, AL, PA, NE, and UK before making it back home to KY and marrying his best friend Heather. They have been married for 20 years and have been blessed with three wonderful boys: Mason , Alex, and Andrew.